September is one of the best months for fishing in the Everglades. With the abundance of live bait around the fishing should be red hot. Snook fishing should remain good providing us with some great fast action. 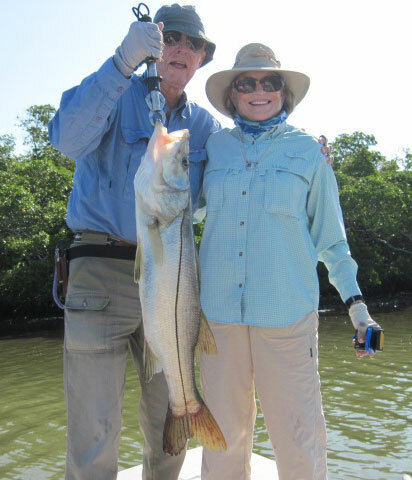 We like to fish for Snook along the mangrove islands in 2-4 ft of water. Live bait work the best for catching Snook this time of year. The Snook we catch can average anywhere from 4 -20 lbs, and provide anglers with lighting runs and head shaking jumps.. Making them one of most popular fish to target in the Everglades. Redfishing will also be heating up in September. Redfish will start to bunch up into schools along the beaches in 3-5 ft of water. A live shrimp or pilchard under a popping cork seems works the best this time of year. Redfish are a great fighting fish, just when you think you have them tired out they start the fight all over again. Trout fishing in September should also be very good! Trout like to school up on the grass flats early in the morning before the afternoon heat sets in. The bait that works the best this time of year are a live pinfish under a popping cork. Trout fishing can provide some fast and great action and make for a great fish dinner. If you would like to get in some great September fishing action please give a call to book a charter in Everglades National Park.